Very limited edition fine art prints for the Disney film "Frozen"
These were only offered for a timed release of 10 days through ACME Archives Direct/ Dark Ink and Disney. I have purchased a limited amount of this rare fine art reproduction and will be hand signing and putting a small sketch of Olaf on each Lithograph sold from the official Brian Rood Art online Store. You will not get these hand embellished one of a kind pieces anywhere other than through my online store right here. The product will ship rolled to you the first week of August. They will premiere at San Diego Comicon and ship immediately upon my return from the event. I will also be offereing preframed editions ready to hang for an additional expense, simply scroll down in print options to see pricing on both versions. These are very limited and will not be reproduced again in this format. prints will be hand-numbered and signed by artist with a sketch of Olaf on each lithograph! 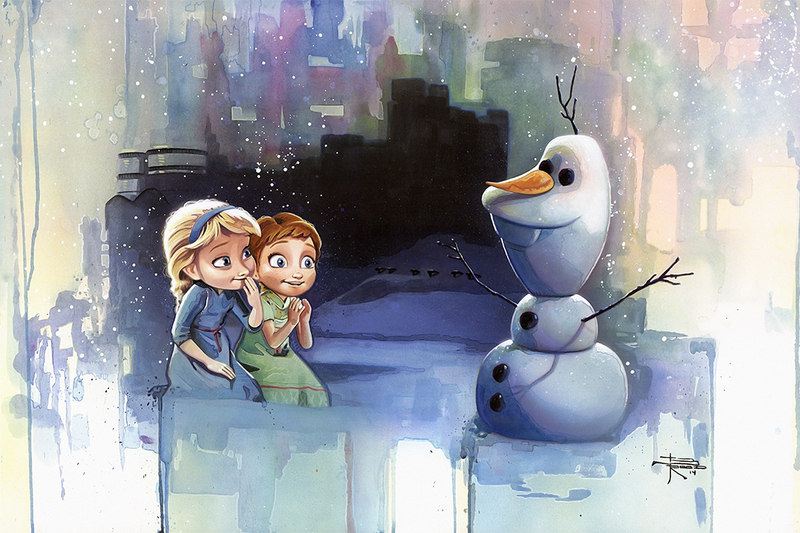 Disney interpretive artwork featuring young Anna and Elsa from Frozen specially created for the Stroke of Midnight timed release, Limited Artist Studio Editions signed and remarked by Brian Rood. All pricing includes professional packing and shipping shipping charges. The price of the unit is shipped direct to your door ready to enjoy!